Ya when i first saw it i wonder which one you were, and then i played a little game in my head trying to decide which of those two pictures was less embarrassing. Then i read what you wrote, and went back to wondering. There's a stain on your shirt. Just though I'd let you know. Yeah, I figured. I like to give random replies to peoples pictures, it makes me happy. Not the most "elegant" picture, but it's the best I have. Do you have your claws yet!? The weapon x program is still looking at my application. Thats me in the blue shirt. Wearing someone elses tie. Yeah.. 12 shots in right about an hour i seriously have no idea what was going on that night. my boy on the left is wearing someone else's vest also.. weird. but i do look kinda like that. 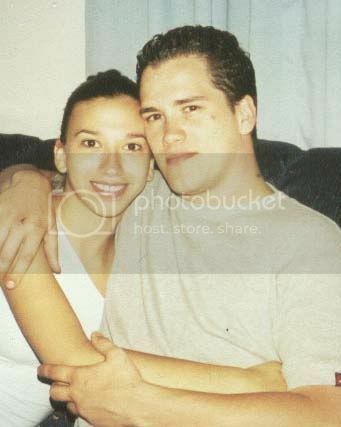 Here is me and the hubby kind of old but the only one I have uploaded of us together. Wow, this picture is old. I'm the one on the left. Playing at the local radio station. I only see one person in the pic. It appears as though someone has an imaginary friend. If he does, he'll be the Guild Pinata. Anthema looks almost exactly like a guy I punched in the face one time. I couldn't think of something more generic to write underneath it. So I picked the two most generic comments I could think of. In my wow guild, there was an application rule: if you're name had anything to do LOTR, regardless of how good you were, there was absolutely no way in hell you were getting invited. See i was getting worried seeing all these normal looking people. We started out so awesome with a guild of angry vikings, but im comforted after seeing Glyth. Most definitely, and wielding a very large battle axe.